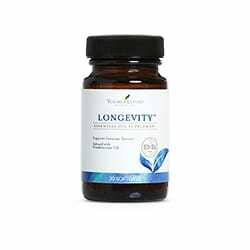 Longevity softgels are a potent, proprietary blend of fat-soluble antioxidants. Longevity softgels are a potent, proprietary blend of fat-soluble antioxidants. Longevity Essential Oil Blend contains oils that rank among the most powerful antioxidants known. Antioxidants are elements that help to neutralize free radicals and lessen the day-to-day oxidative damage everyone is subject to. Longevity softgels are enriched with the pure essential oils thyme, orange, and now frankincense, Longevity protects DHA levels, a nutrient that supports brain function and cardiovascular health, promotes healthy cell regeneration, and supports liver and immune function. * Longevity also contains clove oil, nature’s strongest antioxidant, for ultra-antioxidant support. Studies show that as we age, particular enzymes decrease and free radicals become more abundant. Toxic, polluted environments can also take their toll on the body by increasing free radical production. Smoke, radiation, car fumes, poor diets, polluted water, and even sunlight speed the aging process. Free radicals damage body cells and cause cellular malfunctions and mutations. Precision Delivery softgels release in the intestine for optimal absorption and minimal aftertaste. **As measured by ORAC testingWhat Makes Longevity Unique? Longevity Softgels are part of Young Living’s essential oil supplement line. Many people who use essential oils are also acquainted with herbs, thus, it is easy to assume that essential oils work in the same manner as herbal formulas. This, however, is not the case. Essential oils are highly concentrated forms of fresh or dried herbs and it often takes many pounds of herbs to make a mere ounce of essential oil. Because of their concentrated potency, including their antioxidant activity, it takes only a very small amount of essential oil to achieve the desired antioxidant effects.Who Should Use Longevity™ Softgels? Longevity utilizes coconut oil to ensure essential oils are more evenly dispersed in the body.Coconut oil is also highly resistant to rancidity which preserves the integrity of the oils and prolongs shelf life. E. Basch, et al., “Thyme (Thymus vulgaris L.), thymol,” J Herb Pharmacother. 2004; 4(1):49–67. H. B. Myers, “Thymol therapy in actinomycosis,” JAMA. 1937; 108(22):1875. K. A. Youdim, S. G. Deans, “Effect of thyme oil and thymol dietary supplementation on the antioxidant status and fatty acid composition of the ageing rat brain,” Br J Nutr. 2000 Jan; 83(1):87–93. M. N. Gould, et al., “Limonene chemoprevention of mammary carcinoma induction following direct in situ transfer of v-Ha-ras,” Cancer Res. 1994 Jul 1; 54(13):3540–3. H. Raghavenra, et al., “Eugenol: the active principle from cloves inhibits 5-lipoxygenase activity and leukotriene-C4 in human PMNL cells,” 2006 Jan; 74(1):23–7. Orange Vitality Essential Oil, 5 ml.